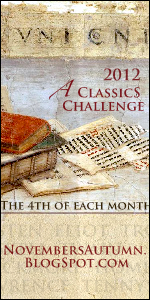 My second challenge for 2012: I have joined up for the Classics Challenge, hosted by November's Autumn. The aim is to read seven works of classic literature in 2012. Only three of them may be re-reads. What is considered a classic? A work that transcends time. Usually it's well recognised but there are many lesser-known gems too. None of these are re-reads. I can't wait to get into them! A lot of bloggers I follow have read Madame Bovary and really liked it. Looking forward to your thoughts on it and thank you for joining the challenge, Jacqui!